Your diastolic reading: This bottom number measures the pressure on your heart when it relaxes between beats – when it isn’t pumping any blood. Anyone who has high blood pressure has a heart that’s quickly pumping blood through their arteries. This causes excessive force that will damage the smooth lining of your blood vessels’ walls. In doing so, fatty plaque will build up to where it creates a “bump.” As more plaque sticks to this bump, it’ll increase in size. Ultimately this will either diminish or stop your flow of blood. Sometimes it can even rupture and cause a traveling blood clot. Studies show that only about half of Americans with this disease successfully have it under control. This is because most people don’t feel that their blood pressure has increased or that they need to have it checked. When you have hypertension your blood vessels throughout your body are damaged – even those responsible for carrying blood to your ears. 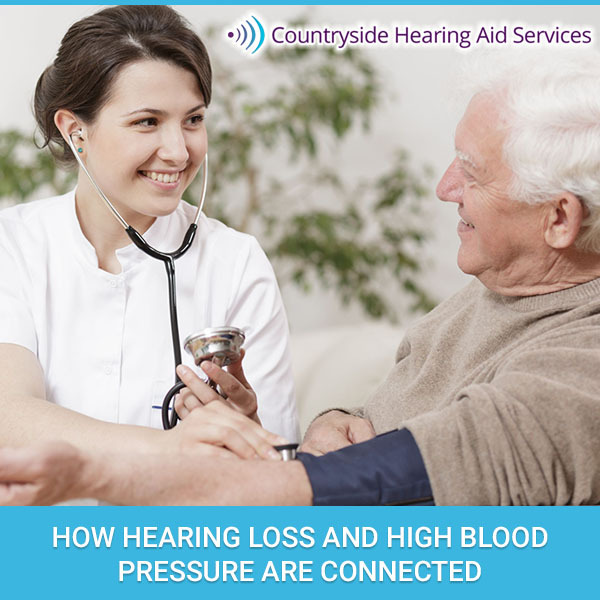 This is why research demonstrates that people with hypertension are also more likely to suffer from hearing loss, especially if you have high blood pressure for a prolonged period of time. If you only have hypertension for a short time your hearing might normalize again once your blood pressure is returned to a normal range. Since your hearing has a significant impact on the quality of your life, you should address any issues immediately instead of just reaching for hearing aids. According to the American Heart Association, there’s a strong link between hypertension and the sudden loss of your hearing. It’s clearly linked to your blood pressure. Researchers are still working to understand the exact specifics of this but for now you should know that this is a significant red flag that you can’t ignore. In fact, this study showed that anyone who experienced sudden hearing loss was also 150% more likely to have a stroke within two years. As you grow older, your body changes, which is why it’s so important to have routine medical checkups regardless of how you’re feeling. During this time you’ll also have your blood pressure checked. Vision, hearing, diabetes, and cholesterol can all be screened. You should also come visit us at Countryside Hearing Aid Services because we want what’s best for our patients. If you’re suffering from hearing loss, we’ll do our best to help you regain the highest quality of life possible. This is something we’ve done for many patients over the years and something we hope you’ll let us do for you too. So give us a call today and let’s see what we can do to help you. ← Smoking and Hearing Loss – There’s a Dangerous Link Here!